A report discussing the announcement claims that raw scans of a surrounding area will be shared between the users, without an interim stop "at rest" on a server someplace. However, how the data would be handled when a player drops out, or for more than two players wasn't detailed. It also remains to be seen if the effort scales to more than two people. If the data is not stored on a central repository, total data transmission demands for the scan data increase exponentially as more players are added to the mix. Google's execution of multi-user augmented reality requires scans of a user's environment which are then sent and stored in the cloud, according to Reuters. This could have what AR publisher Construct Studios CEO Joel Odgen called "really severe privacy implications we haven't really explored yet." Apple's ARKit debuted at the 2017 WWDC. 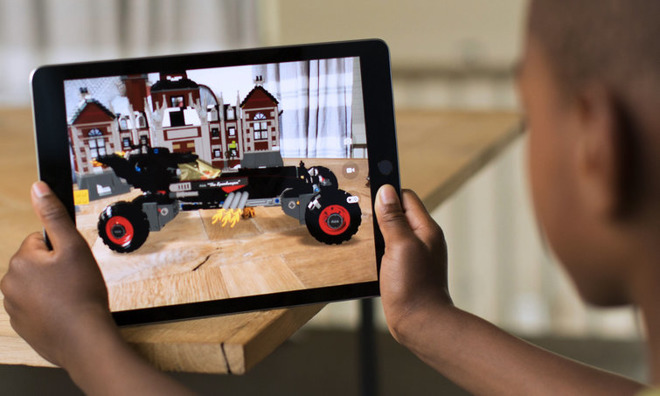 It was updated to version 1.5 with the March 29 release of iOS 11.3 which builds on the original ARKit allowing for integration of real world images in AR experiences and placement of virtual objects on vertical surfaces. For example, movie posters and signs can be made to trigger AR animations viewable through an iPhone or iPad. Major companies including Lego, Ikea, and Amazon have adopted the technology for its apps, with others replacing their own systems with Apple's version. For example, Niantic optimized its Pokemon Go iOS app with ARKit, with the AR+ mode allowing players to "sneak" up on an AR Pokemon to capture it, as well as making the creature's placement in the environment more realistic. Owners of the iPhone X are also able to use ARKit in another way: on their face. ARKit's face tracking system powers the popular Animoji feature, as well as its Portrait Lighting effects, masks, and avatars, which developers are only just starting to use for their own purposes.